Hiawatha Horse Park hosts the return of Flat Track Racing to Sarnia! Saturday September 29th 2018 – Final race of the Harley-Davidson Motorcycles 2018 Championship Series. Hill’s Video Productions Mobile crew will be driving to Sarnia, Saturday morning to survey and plan the optical fiber and audio cabling for the 7:00 PM race. This will be the third race this year for Hill’s under the direction of Aaron Hesmer of Flat Track Canada. These races have been commentated live by Brian “FABS” Koster and “TUMBLIN Todd” Vallee. 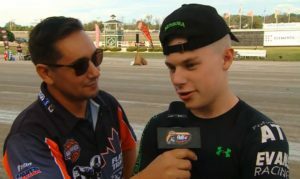 Track side Aaron Hesmer will be interviewing these young riders, finding out where they are from, who is here supporting them at the track and giving them an opportunity to thank their sponsors. If you missed any of these races you can watch the whole race through FACEBOOK Live.